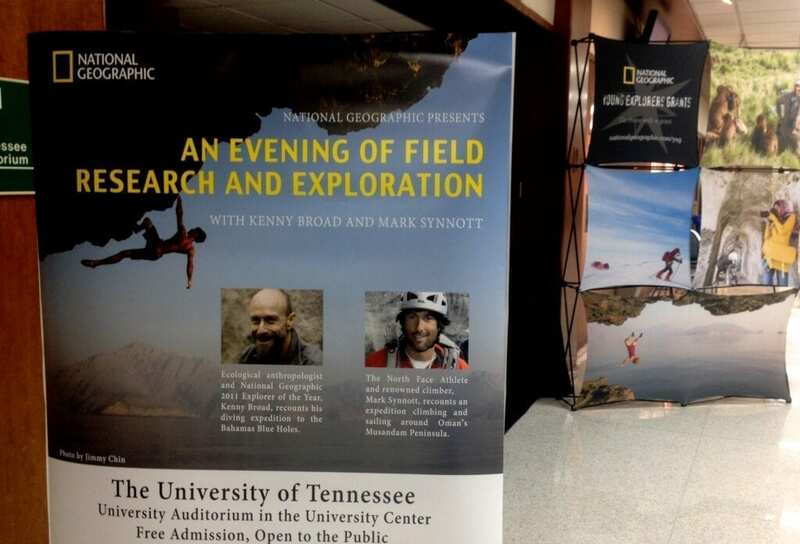 UT hosted two National Geographic explorers on Saturday. Two adventure specialists from National Geographic spoke to an audience at the University Center Saturday, Sept. 21. Kenny Broad and Mark Synnott each gave a short presentation about the expeditions and research they had been involved with. “Let’s cut the lights,” Kenny Broad said on Saturday night. Broad, an environmental anthropologist, studies the links between humans and their environments through extreme scientific expeditions. One of his most recent expeditions was in the Blue Holes of the Bahamas, which earned him the honor of being National Geographic’s Explorer of the Year in 2011. The Blue Holes are a series of underwater caves in the Caribbean. According to Broad, they are one of the least understood and least explored places in the world. Broad explained that some underwater caves have been found to be reservoirs of fresh drinking water, which is crucial to the health of the local people. The caves can also reveal a lot about what the world was like millions of years ago. Over the course of millions of years since the Ice Age, sea levels rose as the climate warmed again, and the caves filled with water. “It’s like swimming through the Ice Age,” Broad said. Broad and his team collected samples of stalagmites, which are the rock formations that form inside the cave. These formations are great indicators of what that area was like during that time period of climate change, and what the future of the climate may be. Broad’s work in the Blue Holes was featured in National Geographic in August 2010. You can read the article here. Following Broad was Mark Synnott, an athlete and researcher with the North Face. Synnott found his passion for adventure through climbing in his hometown of Jackson, New Hampshire. Unsure of what kind of career he wanted to have, Synnott eventually strived to become a “professional adventurer” and began traveling all over the world to seek new and undiscovered great heights. Like Broad, Synnott’s work has many dimensions. Along with traveling to climb, Synnott seeks to interact with the local people, whose existence is often a mystery. One of Synnott’s expeditions took him to the Musadam Peninsula, which is near the Persian Gulf and is accessible only by boat. According to Synnott, the people that live there are called the Kouzaris, and their existence and heritage is largely a mystery to the world. Recently, Synnott’s work took him to the “Dark Star” in Uzbekistan, where he was on assignment for National Geographic. Synnott was a part of a team comprised of Russians, Israelis, Italians, and Germans. Synnott’s work is due to be featured in National Geographic sometime next year.